This is a bit late for August yet it has been a very busy, almost hectic June and July for me. I mentioned my trip to Schuyler, Nebraska before; the place where I had lived for so many years. Now this journey is behind me and even though, I did not have enough time yet to digest all of the impressions I will write a few lines to show that I am still around. For much of my life, Schuyler had been the community where I felt at home. Having left Germany in 1965, I had accepted and enjoyed the American way of life. I accepted citizenship in 1970. For some reason once my superiors changed my life was not the same anymore and I finally returned to Germany in 1998. The pressure had gotten too great on me. I left the States under some dark cloud. Now going back it was a most glorious come-back to a community that I have known for many years. 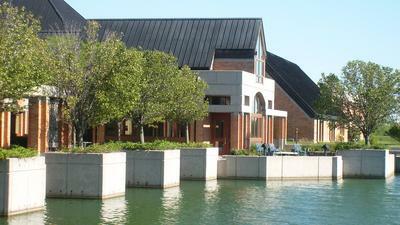 And St. Benedict Center which I helped to plan and build is doing so well that I am really pleased. It seems the work and planning we did has produced a beautiful space of quiet and solitude for those who want to make a retreat or turn to God in private prayer. And this is what it was all about: to give people space and an oasis where they can experience quiet in a beautiful setting. 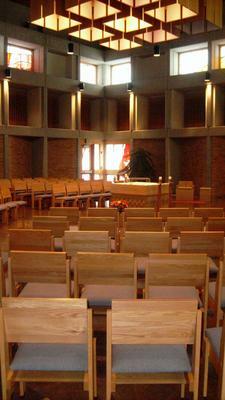 As the pictures will show you it is a nice place and inviting to come and let go, to reflect and meditate. Perhaps this shows me something too. The efforts and headaches of the time of preparation for the building phase, my dreams and vision were not in vain. 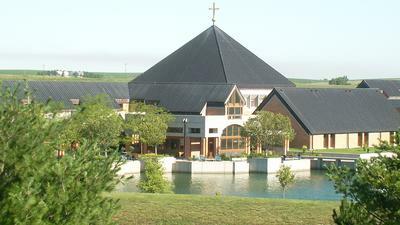 It seems to me that the Lord has taken all this and made it into what it is today, a beautiful retreat center for the people of Nebraska and surrounding States. A place where one can relax and sit back and walk along a lake and among trees and nicely kept greens.